All specimens on this page are now 40% off. Just discount the prices by 40%. JC8721. 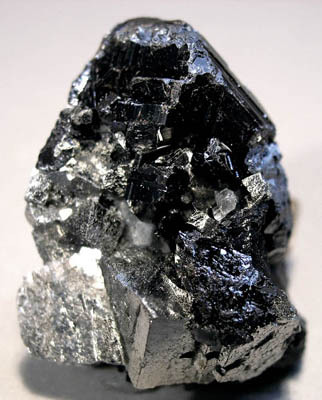 Acanthite Imiter mine, Imiter district, Djebel Saghro, Ouarzazate province, Souss-Massa-Draa region, Morocco. 2.6 cm tall Thumbnail. $45.00. Fairly sharp group of crystals. JC3044. Acanthite. Uchucchacua, Oyon province, Lima department, Peru. 12 x 25 mm 13g. $15.00 A crude near floater crystal. JC9034. 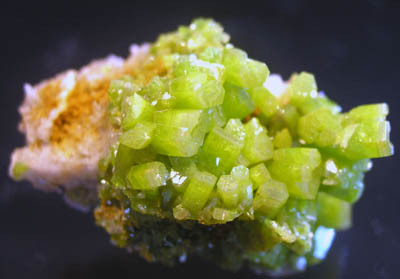 Adamite. Ojuela mine, Mapimi, Durango, Mexico. A greenish brown ball of adamite. Thumbnail about 2cm across on the adamite. $5.00. JC4844. 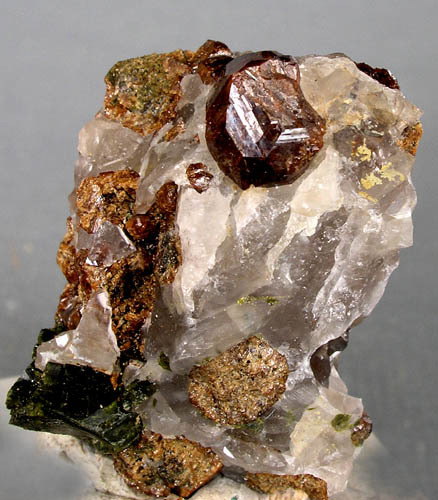 Andradite. South Peacock mine, Seven Devils dist., Adams Co., Idaho. 2 x 2.5 cm 18g. $5.00 TN A crack is visible in the lower right portion of the crystal. Another view is shown below. JC4851. Andradite. South Peacock mine, Seven Devils dist., Adams Co., Idaho. 2.5 x 2.5 cm $5.00. TN 7mm crystal in quartz. The crystal is complete although somewhat poorly formed on the upper right. JC8944. Augelite. Ortega mine, Mundo Nuevo mine area, Mundo Nuevo, Huamachuco, Sanchez Carrion province, La Libertad department, Peru. 1.2 x 1.8 x 2.1 cm $50.00. Nice light yellow green thumbnail. JC8944. Another view. Small quartz crystal attached. JC8064. Augelite. Ortega prospect, Mundo, Mundo Nuevo, Huamachuco, Sanchez Carrion Province, La Libertad Department, Peru. 1 x 1.5 cm crystal. $60.00. Sharp crystal of this rarely crystallized mineral. JC8053. Augelite, quartz. Ortega prospect, Mundo, Mundo Nuevo, Huamachuco, Sanchez Carrion Province, La Libertad Department, Peru. .9 x 1.4 x 2 cm thumbnail. $35.00. Sharp crystal of lime green color. JC7993. Augelite, quartz. Ortega prospect, Mundo, Mundo Nuevo, Huamachuco, Sanchez Carrion Province, La Libertad Department, Peru. 1.5 x 1.8 cm 3g. Sharp, lime green thumbnail. $90.00. No damage to naked eye. JC7970. Augelite, quartz. Ortega prospect, Mundo, Mundo Nuevo, Huamachuco, Sanchez Carrion Province, La Libertad Department, Peru. 2 x 3.5 cm 9g. $175.00. A nice sharp lime green/ice green crystal on a bit of quartz, with another crystal offset on the top. Main crystal is 2 cm long. A very good thumbnail of this relatively rare mineral. JC7647. Augelite, quartz. Ortega prospect, Mundo, Mundo Nuevo, Huamachuco, Sanchez Carrion Province, La Libertad Department, Peru. 2.2 x 2.5 cm 6g. $110.00. A nice sharp yellowish green crystal with a quartz crystal attached. JC7953. Azurite. Kerrouchene, Khenifra province, Meknes-Tafilalet region, Morocco. 1.5 x 3 cm 8g. $25.00. A bright single crystal as is common for specimens from here...they have a real tendency to pop off the hard matrix when trying to be collected. JC7818. Azurite. Kerouchene, Morocco. 2 x 2 x 2.8 cm 29g. $25.00 A nice bright thumbnail. JC7802. Azurite. Kerouchene, Morocco. 1.7 x 2 cm 3g. $18.00. Bright, sharp thumbnail with dust I didn't see. JC3608. Barite. Magma mine, Superior, Pioneer district, Pinal mountains, Pinal county, Arizona. 1.2 cm x 1.5 cm 2g. $5.00. A single, zoned, thumbnail crystal. Collected in the 1960's. JC8814. Barite, quartz, stibnite. Murray mine, Independence Mountains district, Elko county, Nevada. 2.5 x 3 cm 29g. $12.00. Cute thumbnail, with a barite crystal (pierced by stibnite?) and a layer of sparkly drusy quartz on top. JC7195. Barite. Stoneham, Weld county, Colorado. 2 x 2 cm 9.2g. $20.00 Before the more elongate crystals were produced from here, these tabular crystals were collected. Now rarely seen. This is a good example of a partially transparent light blue crystal. JC7294. Barite. Stoneham, Weld county, Colorado. 1.7 x 2 cm $15.00. Before the more elongate crystals were produced from here, these tabular crystals were collected. Now rarely seen. This is a good example of a partially transparent light blue crystal group. JC7295. Barite. Stoneham, Weld county, Colorado. 2 x 3 cm $15.00 Two partial crystals. Before the more elongate crystals were produced from here, these tabular crystals were collected. Now rarely seen. This is a good example of a translucent to partially transparent light blue crystal. JC7296. Barite. Stoneham, Weld county, Colorado. 1.7 x 3 cm $10.00. Before the more elongate crystals were produced from here, these tabular crystals were collected. Now rarely seen. JC7297. Barite. Stoneham, Weld county, Colorado. 1.5 x 2 cm $15.00 Before the more elongate crystals were produced from here, these tabular crystals were collected. Now rarely seen. JC7937. Beryl, schorl. Erongo, Namibia. 1.2 x 2 cm 7g. $35.00. Nice sharp thumbnail. Color is a very pale green. 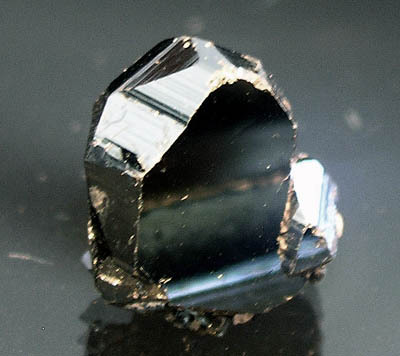 The beryl crystal is resting on black schorl. JC7977. Cassiterite. Pingwu mine (Huya W-Sn-Be deposit; Xuebaoding W-Sn-Be deposit), Huya township, Mt Xuebaoding, Pingwu Co., Mianyang Prefecture, Sichuan Province, China. 1.7 x 2.5 cm thumbnail. $40.00. A gemmy, twinned, crystal. JC7959. Copper. Itauz mine, Zhilandy group, Karagandy province, Kazakhstan. A 2.5 cm tall complex crystal group. $20.00. Thumbnail. Nice clean group. JC7985. Dioptase. Tsumeb mine, Tsumeb, Namibia. 18mm tall thumbnail. $125.00. Ex Sid Pieters collection. Collected in 1978. Sharp thumbnail. No damage. JC7947. Fluorite. San Martin mine, San Martin-Sabinas district, San Martin, Municipio de Sombrerete, Zacatecas, Mexico. 1.7 x 2 cm crystal. 8g. $8.00. Thumbnail. Although listed as one of the desirable minerals from the San Martin mine, rarely are specimens available for sale. Mine closed in early 2000's and hasn't reopened. JC7947. Another view. Tungsten lighting. JC8042. Gahlkaite. Getchell mine, Adam peak, Potosi district, Osgood mountains, Humboldt county, Nevada. 2 x 2.5 cm 9g. $15.00. Small bright cherry red crystals on quartz. JC3807. Hematite. Nchwaning II mine, South Africa. 12mm x 16 mm. 6g. $20.00. Mirror bright luster. The reflections on the face are of the photo table, not markings on the crystal. JC7635. Libethenite. Mindola pit, nr. Kitwe, Zambia. $50.00 A sharp 1.5 cm diameter crystal. Two views are shown. JC480. Millerite. Estabrook Park, Milwaukee, Wisconsin. 2.5 x 2.5 cm 32g. $15.00. A little spray of crystals in a calcite lined vug. A long extinct locality. JC5875. Neptunite, benitoite. Dallas gem (Benitoite) mine, San Benito County, California. 2 x 3 cm 12g. $125.00. A 3 cm neptunite, with some red areas from included crossite. A crude benitoite partial crystal is attached to the base of the neptunite. Nice thumbnail. JC5875. The benitoite partial crystal can be seen on the left side base of the neptunite. JC5838. Neptunite. Dallas gem (Benitoite) mine, San Benito County, California. 2 x 2.5 cm 6g. $75.00. A 1.8 cm sharply terminated single crystal. A very nice little thumbnail specimen. Four views are shown. A top view. A view of the end of the termination, and two side views. JC5838. The other side view. JC8228. 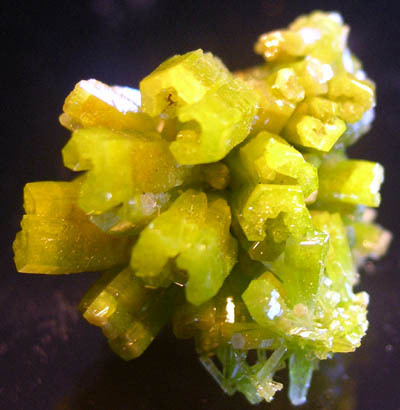 Pyromorphite. Daoping mine, Gongcheng county, Guilin prefecture, Guangxi Zhuang autonomous region, China. A 15 mm long crystal group. $5.00. JC1959. Pyromorphite. Daoping Pb-Zn mine, Gui Lin, China. 2.5 x 3.2 cm 18g. $30.00. Lime green with a hint of yellow TN. JC1964. Pyromorphite. Daoping Pb-Zn mine, Gui Lin, China. 1.8 x 1.8 cm. 9g. $28.00. Lime green with a hint of yellow, TN. JC7942. Rutile. Champion mine, White Mountains, Mono county, California. 2 x 2 cm thumbnail. $30.00. A nice crisp crystal on pyrophyllite. JC8056. Silver. Uchucchacua mine, Oyon province, Lima department, Peru. A 2 cm tall wire. $30.00. JC7819. Smithsonite. Tsumeb, Namibia. 2 x 3 cm 10g. $75.00. An 11mm crystal. Several views are shown. JC7819. Another view (slightly blurry, my apologies). JC9749. Spessartine. Shengus, Haramosh mountains, Skardu district, Gilgit-Baltistan province, Pakistan. 1.7 x 1.7 x 2.5 cm 13g. $20.00 A 2 cm crystal. No obvious damage. JC8700. Stolzite pseudo scheelite, Thompson workings, Darwin mine, Darwin, Darwin district, Inyo county, California. 2.5 x 2.9 cm crystal group. Thumbnail. $30.00. These were initially thought to be scheelite, but work at the Mackay school of mines confirmed that they are Stolzite pseudomorphose after scheelite crystals. Found in 2006, this particular batch has proven to be a one time find. This would make them some of the world's best stolzites if you don't mind the fact they are pseudomorphs. Colors on these vary from light tan to light gray. Some of them have a bit of luster when turned in the light. JC8702. Stolzite pseudo scheelite, Thompson workings, Darwin mine, Darwin, Darwin district, Inyo county, California. 2 cm crystal. Thumbnail. $30.00. These were initially thought to be scheelite, but work at the Mackay school of mines confirmed that they are Stolzite pseudomorphose after scheelite crystals. Found in 2006, this particular batch has proven to be a one time find. This would make them some of the world's best stolzites if you don't mind the fact they are pseudomorphs. Colors on these vary from light tan to light gray. Some of them have a bit of luster when turned in the light. JC8703. Stolzite pseudo scheelite, Thompson workings, Darwin mine, Darwin, Darwin district, Inyo county, California. 1 cm partial crystal. Thumbnail. $5.00. These were initially thought to be scheelite, but work at the Mackay school of mines confirmed that they are Stolzite pseudomorphose after scheelite crystals. Found in 2006, this particular batch has proven to be a one time find. This would make them some of the world's best stolzites if you don't mind the fact they are pseudomorphs. Colors on these vary from light tan to light gray. Some of them have a bit of luster when turned in the light. JC8704. Stolzite pseudo scheelite, Thompson workings, Darwin mine, Darwin, Darwin district, Inyo county, California. 1.2 cm partial crystal. Thumbnail. $5.00. These were initially thought to be scheelite, but work at the Mackay school of mines confirmed that they are Stolzite pseudomorphose after scheelite crystals. Found in 2006, this particular batch has proven to be a one time find. This would make them some of the world's best stolzites if you don't mind the fact they are pseudomorphs. Colors on these vary from light tan to light gray. Some of them have a bit of luster when turned in the light. JC8707. Stolzite pseudo scheelite, Thompson workings, Darwin mine, Darwin, Darwin district, Inyo county, California. A 1.5 cm crystal. Thumbnail. $25.00. These were initially thought to be scheelite, but work at the Mackay school of mines confirmed that they are Stolzite pseudomorphose after scheelite crystals. Found in 2006, this particular batch has proven to be a one time find. This would make them some of the world's best stolzites if you don't mind the fact they are pseudomorphs. Colors on these vary from light tan to light gray. Some of them have a bit of luster when turned in the light. JC8710. Stolzite pseudo scheelite, Thompson workings, Darwin mine, Darwin, Darwin district, Inyo county, California. A 1.8 cm crystal. Thumbnail. $20.00. These were initially thought to be scheelite, but work at the Mackay school of mines confirmed that they are Stolzite pseudomorphose after scheelite crystals. Found in 2006, this particular batch has proven to be a one time find. This would make them some of the world's best stolzites if you don't mind the fact they are pseudomorphs. Colors on these vary from light tan to light gray. Some of them have a bit of luster when turned in the light. JC8715. Stolzite pseudo scheelite, Thompson workings, Darwin mine, Darwin, Darwin district, Inyo county, California. 2 cm group of crystals. Thumbnail. $20.00. These were initially thought to be scheelite, but work at the Mackay school of mines confirmed that they are Stolzite pseudomorphous after scheelite crystals. Found in 2006, this particular batch has proven to be a one time find. This would make them some of the world's best stolzites if you don't mind the fact they are pseudomorphs. Colors on these vary from light tan to light gray. Some of them have a bit of luster when turned in the light. JC8062. Tarnowitzite (plumbian aragonite), smithsonite. Tsumeb mine, Tsumeb, Namibia. 2 x 2.3 cm $50.00. Thumbnail. A sharp 2 cm crystal on the side of a small group of brownish smithsonite crystals. JC8860. Tyrolite. Majuba Hill, Pershing county, Nevada. 2.2 x 2.5 cm thumbnail. $5.00. JC9791. Vanadinite. Puzzler mine, Yuma county, Arizona. 1.5 x 2.5 cm $5.00. A little thumbnail from this now closed and sealed mine. Collected in 1998. JC9792 Vanadinite. Puzzler mine, Yuma county, Arizona. 1.7 x 2.5 cm $5.00. A little thumbnail from this now closed and sealed mine. Collected in 1998. JC9794. Vanadinite. Puzzler mine, Yuma county, Arizona. 2 x 3 cm $5.00. A toenail/thumbnail from this now closed and sealed mine. Collected in 1998. JC8043. Vanadinite coated with mottramite on quartz. Otjitheka, Kaokoveld, Namibia. A 2.5 cm long thumbnail. 6g. $18.00. JC8003. Vanadinite. ACIF mine area, Mibladen, nr. Midelt, Khenifra Province, Meknes-Tafilalet Region, Morocco. 2.2 x 2.7 cm crystal 19g. $45.00. Sharp, complex crystal group. Very minor dings here and there. JC8003. Backside view. The chipped backside of the crystal is visible in the upper right of the specimen. JC7989. Vanadinite. ACIF mine area, Mibladen, nr. Midelt, Khenifra Province, Meknes-Tafilalet Region, Morocco. 2.3 x 2.6 cm 13g. $25.00. Complex crystals. JC5238. 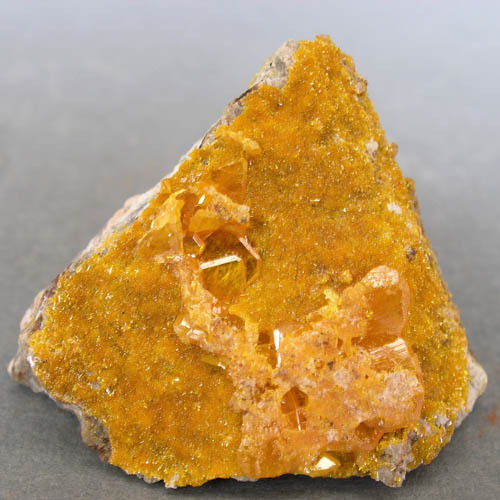 Wulfenite, mimetite. Rawhide mine, Rawhide wash, Artillery Mountains, Mohave Co., Arizona. 2.3 x 2.5 cm 10g. $10.00. A TN with scattered small wulfenite crystals.